The zombie apocalypse is about to begin. Jane just doesn’t know it yet. Jane collapses during a routine health exam for college, triggering a nightmarish memory from high school. While interning at a medical clinic during her senior year, Jane discovers patients acting strangely, attacking staff, and devolving into violent animals. Something is horribly wrong. Strange Start is the prequel to the Jane Zombie Chronicles, a series of post-apocalyptic stories. If you’re on the prowl for your next zombie book series, give this one a try. Sink your teeth into Strange Start now! Get This Young Adult Book From Amazon. Born and raised outside of Philadelphia, Pennsylvania, Gayle discovered her passion for zombies when her husband introduced her to video games in 2009. Gayle writes about the undead because they scare the bejesus out of her and she likes it! She’s also an advocate for always facing your fears as she’s an author of self-help books too. 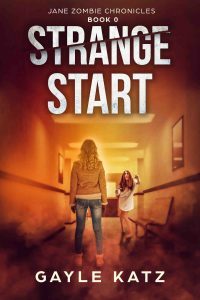 STRANGE START is the short story prequel to get you hooked on JANE ZOMBIE CHRONICLES, a series of YA post-apocalyptic books.